In the kitchen, Mrs. Zuckerman suddenly made an announcement. 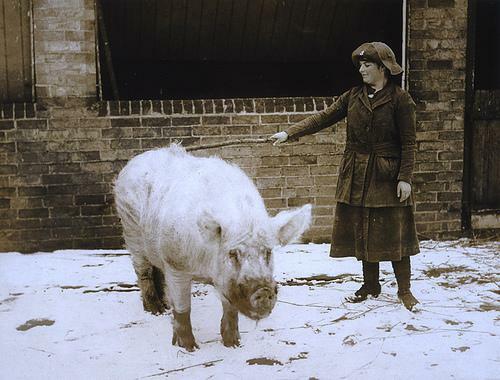 “Homer” she said to her husband, "I am going to give that pig a buttermilk bath." "A what?" said Mr. Zuckerman. "A buttermilk bath. My grandmother used to bathe her pig with buttermilk when it got dirty--I just remembered." "Wilbur's not dirty," said Mr. Zuckerman proudly. "He's filthy behind the ears," said Mrs. Zuckerman… "and he's going to have a bath." Mr. Zuckerman sat down weakly and ate a doughnut. His wife went to the woodshed. When she returned, she wore rubber boots and an old raincoat, and she carried a bucket of buttermilk and a small wooden paddle. "Edith, you're crazy," mumbled Zuckerman. But she paid no attention to him. Together they walked to the pigpen. Mrs. Zuckerman wasted no time. She climbed in with Wilbur and went to work. Dipping her paddle in the buttermilk, she rubbed him all over….Charlotte [the spider] got so interested, she lowered herself on a dragline so she could see better. Wilbur stood still and closed his eyes. He could feel the buttermilk trickling down his sides. He opened his mouth and some buttermilk ran in. it was delicious. He felt radiant and happy. observations: Charlotte’s Web has one of the finest opening lines in children’s literature: “Where’s Papa going with that ax?”, (all set for one of those joke 2nd lines to short-circuit the plot: "Papa is on his way BACK from the hoghouse Fern dear") and though the rest of the book doesn’t really live up to that, it is one of the most popular and successful books ever. Perhaps you have to read it as a child – coming upon it later in life, its charms are harder to spot, and it seems a strange combination of animal and human threads, with the author rather losing interest in the horribly-named Fern after a bit. But we have to bow to popular opinion – everyone else loves it. Links up with: Cold Comfort Farm is a rather different kind of homestead. Anne of Green Gables lived on a farm too. Picture is from the UK’s National Archive and can be found on Flickr. Mrs Z looks a lot like the UK actress Dawn French.